Carl Packman exposes the sick underbelly of anti-Semitisim at the heart of George Galloway’s victorious Bradford West by-election campaign. Before long it was being dubbed the Bradford Spring, the implication being that a despot was ousted while a rainbow coalition of groups has united in search of the goal of democracy. 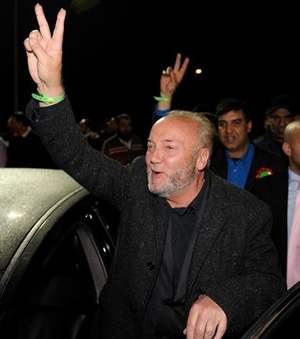 But unity was the last thing Galloway had on his mind when he took to the road. Reading around I found that the Muslim Public Affairs Committee, an organisation that wants to empower “Muslims to focus on non-violent Jihad and political activism”, who naturally support Galloway and Respect, had published a blog post on the Bradford West Labour candidate Imran Hussein, describing him as “thirsty”, dishing out ad hominem attacks, relaying childish jibes that Hussain “might have to rely on his trusted pals John E Walker and Jackie Daniels to give him a hand”. One of course would naturally assume that this level of politics be beneath the anti-war firebrand. But of course this turned out to be false. His references to his Labour opponent as a “Muslim” in inverted commas made it obvious he wanted the “Muslim faith and Pakistani heritage” vote because he was the real Muslim candidate, which Labour rightly responded to as a “bizarre and deeply insulting letter”. While on the trail Galloway also dragged out of the woodwork supporters of note, namely Carole Swords and Yvonne Ridley. Swords, chair of the Tower Hamlets Respect Party, was convicted in February for slapping a Jewish man during a boycott protest at a supermarket. Making the line between anti-Semitism and anti-Zionism even thinner she was previously found to have written on Facebook that Zionists are “cockroaches” who “hide in the dark and try to create havoc where they lay their eggs” and that those “slimy, vile, hard skin bugs need to be stomped out”. Yvonne Ridley, on the other hand, who is reported once to have said she’s “quite a fan of Mahmoud Admadinejad who is adored by the common man and woman in Iran”, and that “Zionists have tentacles everywhere”, told supporters of Galloway’s campaign recently that sentences handed to young men after the Bradford riots represented an “apartheid-style justice that we haven’t seen since the days of South Africa”. With the “most sensational victory in British political history” and comparisons to South Africa, Bradford ought to feel like the centre of the universe. But in the age of austerity it drew a cheap politician. The way in which Galloway conducted his deeply divisive campaign should leave him with nothing to be proud about. But as I said yesterday he doesn’t care about you, or me or Bradford, or Glasgow or Bethnal Green, or Joe Public, or the man-in-the-street. Galloway is a one-man brand, and one who appeals to low politics and dirty tricks – what a pity that we have to see him in parliament (occasionally) again. Fair enough, I wouldn’t stoop so low as to accuse you of sharing all of Galloway’s views. But he’s not right wing. Surely you can see that? He ran on a platform of ‘no cuts’ and ‘bash the banks’. That’s got to be more right than left, to put it mildly. If you mean that his views on Palestine are more right than left, I don’t think that’s right either. You come to a left wing site and troll. You troll specifically, calling people mentally ill.
Then you say, against the evidence, you’re not a social darwinist. You’re a bed-buddy to the Tories, your denials smell like sun-ripened rat. I don’t think, bluntly, that you can call anyone who has said that suicide bombings can be morally justified, and has supported Hizbollah (who have declared for Syria-Iran, remembering what’s going on in Syria right now) can reasonably be called left-wing on the issue. From my POV, the Arab Spring is great (and will become better as the Arab countries directly affected build democratic institutions) – it’s actually made the Arab League sit up and be reasonable on the whole issue of the Palestinian Arabs. Sadly, with two weak governments (The Isralie government has a VERY slim majority, and is being hammered in the polls, while the current division of the West Bank and Gaza undermines the Palestinians) nothing will happen right now. The next Israeli government is very likely to be more left-leaning…the real big question is what Hamas will do if the elections go against them in Gaza. he was acting like a low life jew so he got smacked, carole swords gets my vote. I think it’s vital to apply scrutiny like this to a man who has clearly played low politics in a seat he went for because he knew he could pull this sort of cheap tactic and win. We’ve had 6 by-elections since the general election in George chooses this one to jump in – you have to ask yourself why he waited. "@leftfootfwd: On Galloway, read about the sick anti-Semites at the heart of Respect’s band of bigots: http://t.co/rVXfI7cB #Bradford #PMQs"
You grabbed our attention with the Sunesque headline then presented us with 2 segments of quotes without any context and a tidbit about Carole Swords who I see from C Larus below the facts of that case are disputable at best. I, like Larus am no supporter of Galloway (sending from Dublin) but there’s an opening for your style of journalism in any of the tabloids lads. As others have already stated, this is no more than hate-filled propaganda, aimed at trying to make George Galloway out to be an anti-semite for associating with Muslims and anti-zionists… in the same sense, your suspicion of him and his Muslim followers/supporters/friends could be seen as no more than out-right zionism or islamophobia. Of course it probably isn’t, but the basis of your argument is non-existent. That is factually incorrect. Many Jews are categorically NOT Zionists and, funnily enough, I have met Zionists who are not Jews. Know your enemy, Melanie; racist bile aside, you’re just incorrect. "@leftfootfwd: On Galloway, read about the sick anti-Semites at the heart of Respect’s band of bigots: http://t.co/qCWbNPtM #Bradford #PMQs"
Oh how charming. ‘Low life jew’. Are you sure you haven’t wandered in from ‘Stormfront’? As I always believed, nazis are alive and well in left wing politics. It’s natural, Hitler was a socialist after all. Like his modern prophet, Galloway. Zionism is “the right of self determination for the Jews”. Or to put it another way, the right for Jews not to be harassed and murdered by racists like Galloway. After all, what have the Jews given the modern world? 130 Nobel prizes for everything from peace to medicine and economics proves nothing I guess. Doesn’t matter what they give to the world, how many millions of lives they save, they’ll always be hated. Israel is a tiny country that is guilty of the heinous crime of being in the Middle East and not being Islamic. Nothing more. The fact that the chairman of their parliament is an Arab is ignored, as are their law freedom for all, you can’t attack Jews if you admit theirs is the only free state in a region where to oppose religious control s to very killed. It’s a place Where gay pride marches take place and food, illegal under religious laws is freely served. This is intolerable to Islamists (and I don’t mean Muslims who are peaceful people but Islamists who are the most evil people on the planet today) and their representatives such as Galloway. He doesn’t care that innocent Muslims and Christians are being murdered in their thousands because it’s being done by his beloved Islamists. But if a single Jew should defend himself – we have marches and outrage. The fact that more women and children died in a single week in Syria that in the whole Gaza campaign doesn’t matter. The fact that many Israeli soldiers were killed because they refused to shoot an armed, brainwashed child is irrelevant. Rockets stored in and fired from schools irrelevant. All that matters is attacking Jews. And where can Jews go when Galloway gets his caliphate? Anti Zionist = anti Semite. Jews are not despised by the civilised world. Indeed the only parts of the world they are despised is in Moslim countries which hardly qualify as civilised. I see. No one who does anything unpleasant can be from the left. Got it. You are right about Galloway being a hypocritical, rabid anti-Semite, though. A contradiction in terms here. Use of civilized world combined with a totally uncivilized prattish comment. You fortunately, and people like you, have never spoken for the ‘civilized world’ and never will. One test of ‘civilized’ I suppose would be to ask yourself how many Nobel prizes for science, literature and the arts Jews have notched up versus Muslims. I think you’ll find the score is something like 80 to 2.